To help support your Spring into Self-Love, I have crafted a special package of my best work so you can take a deep dive into YOU and your Self-Loving practice. The Importance of Self-Love workbook. This workbook is an in-depth exploration of YOU designed to help you discover more of your unique expression, so you can cultivate more Self-Love. 5 Days of Self-Love Program. 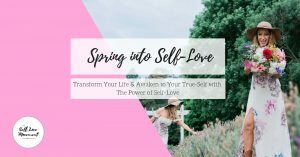 This program is an in-depth discovery of Self-Love designed to supercharge your daily practice and get clear on who you are and the things holding you back. You will become solid and sovereign with Self-Love. This workbook is designed to ignite your happiness, shift your perceptions and learn the secrets of life so you can live your best expression and not let any event or experience separate you from your own happiness. Sacred Heart Guided Meditation and Light Activation with a bonus Mantra Mandala infused with love and positive intentions. For extra inspiration, empowerment and support.